For fans of one-pot Louisiana cooking, a stick of Louisiana andouille (ahn DOO wee) is a beautifully savory sight to behold. A properly made link of this dense, porky delight carries more heft than a standard smoked sausage (about 2 to 2.5 inches in diameter) and in its cured state can fill a room with the powerful aroma of woodsmoke. Cut into it and you’ll feel a coarse, chunky texture that’s closer to spicy ham than your average kielbasa. Browned in a little oil, chunks of andouille give off the smell of crispy breakfast bacon with a little garlic and pepper thrown in for good measure. It’s no wonder that andouille is a classic, go-to flavoring meat for many red beans aficionados. 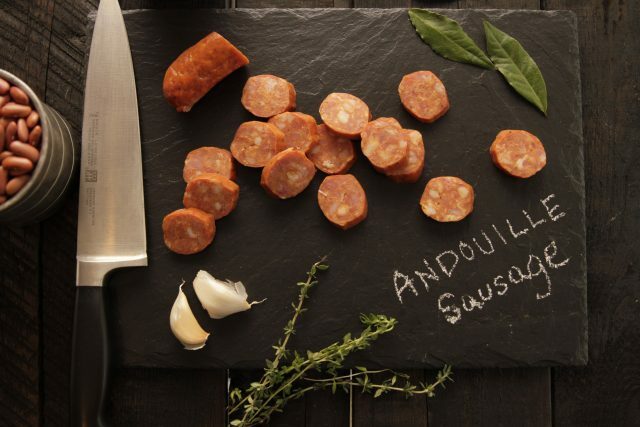 Despite having a decidedly French name, andouille owes its trademark flavor to the sausage traditions of a different South Louisiana immigrant group — the Germans. Beginning in the 1720s, German pioneers from the Rhineland came to the New World and settled up the Mississippi River from New Orleans in modern-day St. Charles, St. James and St. John the Baptist parishes (a region known as the Cotes des Allemandes or German Coast). In the years since, the farmers and sausage makers built a reputation for a traditional sausage-making style that’s as delicious as it is straightforward. The style calls for chunks of lean pork shoulder to be simply spiced with garlic, salt, black pepper, cayenne and salt, then put in sausage casings and slow-smoked for hours over smoldering pecanwood fires. Before the advent of modern refrigeration, farmers would make andouille as part of the cold-weather hog slaughters (called boucheries) that filled home larders for the warmer months. Thick links of andouille — cured by salt and smoke —would hang in the barn until they made their way to into bean pots or batches of gut-warming gumbo. And over centuries, the Germans gradually intermarried with Acadian communities and contributing their distinctive foodways to evolving Cajun culture. 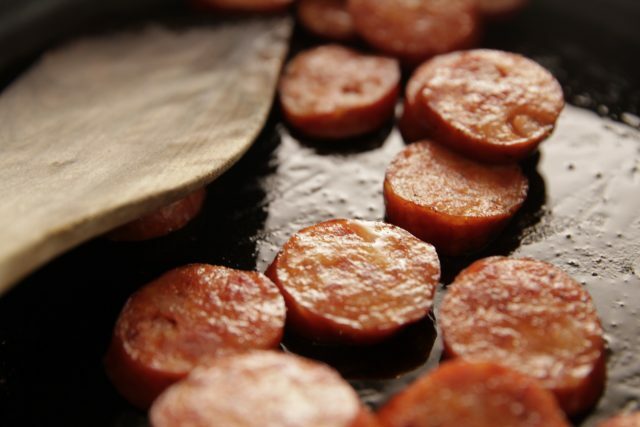 Their andouille — a prize of south Louisiana’s culinary traditions and staple of local meat-market culture — earned the German Coast town of Laplace the title “Andouille Capital of the World” in the 1970s. The taste and texture — with plenty of smoke, a jolt of garlic and just a bit of peppery heat — might just raise your standards as garden-variety smoked sausages pale in comparison. 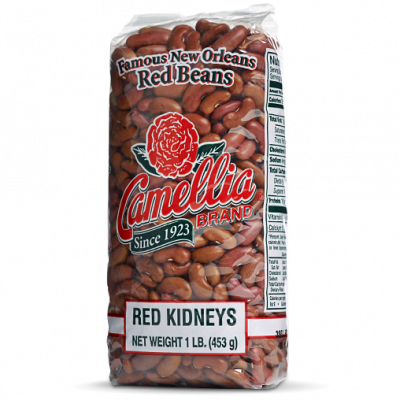 As for the red beans: the chunks of andouille will add a smoky savor to the pot, with the occasional morsel of hammy goodness adding texture to the creamy beans. KITCHEN NOTE: In many grocery store meat sections, you’ll find products labeled “andouille” that pretty closely resemble standard-issue smoked sausage (albeit with a little added pepper or other flavorings). These products (such as Manda’s, Savoie’s and Richard’s brands) have a smoother texture than the classic meat market style, and as such don’t have the inedible casing issue. Just slice ’em as you would smoked sausage and brown ’em in the pan. If you’re lucky enough to live in south Louisiana, check your local community meat markets for the real stuff. Small-town butchers pride themselves on this Cajun classic. Barring that, you can get grocery store sausages called andouille, but with a word of caution. Many commercial sausage makers just add additional spices (cayenne, paprika for color) to regular smooth-textured sausage and call it andouille. And though it might be delicious, it’s no substitute for the real thing. If you’ve got a direct connection to Cajun Country, you owe it to yourself to try out the real deal, preferably from a local meat market or purveyors from LaPlace, LA. Here are a couple of recommended purveyors from the Andouille Capital of the World.